Clay is a wonderful ingredient to make crafts and show your creativity to the fullest. You get to shape and mold clay into any shape you like and even decorate it any way you want. But do you know what gives the most fun? It’s making clay from scratch. Clays can be really expensive, but you can easily make it in your house with just a handful of ingredients. There are a plethora of ways you can make clay at home, and each of the methods will give you a different type of clay to play and enjoy. From baked clay to no-bake clay recipes, below mentioned are simple ways to make clay at home. How To Make Clay At Home? In a saucepan, add salt and water and heat for 4 to 5 minutes. Remove from the heat and then add 1 cup cornstarch and some cold water. Stir until you get a smooth mix and then cook until it acquires a thick consistency. Now you need to let the clay cool down and then shape it any way you like. You can either decorate it with markers, paints, glitters or finish with clear nail polish or acrylic spray. You can store the unused clay in an airtight container or a Ziploc bag. In a large mixing bowl, add water and food coloring. If you don’t want to add food coloring, you can skip adding it and mix the dry ingredients, i.e., flour and salt to the mixture. Mix it with a spoon or stirrer and add 3 to 4 tablespoons of oil to the mixture. If the mixture seems dry, you can add a bit more oil to it. It will keep the recipe soft. If your kids like glitter, this is the perfect time to add it to the mixture. Mix and then knead the ingredients together until you get smooth clay. In a mixing bowl, add bread, glue plus detergent concoction or glycerin and knead until the mixture does not feel sticky. Separate the portions and add a few drops of different food coloring of your choice. Knead until you get a uniform color. Now your job is to shape the clay. You have to brush your self-made sculpture with equal parts of water and glue. It will give the sculpture a smooth appearance. Now leave it to dry overnight. Next, you can decorate the clay with acrylic paints or anything of your choice. In a mixing bowl, add salt, flour, alum and knead. If you think the mixture is a bit too dry, add another tablespoon of water and knead. If you want to make the dough colored, you can divide the dough into different parts and add a few drops of food dye to it. Knead until the dough balls acquire a uniform color. Now your job is to roll or mold the dough into ornaments. Firstly, roll the dough at least 1/8 inch on the floured surface and make cute figures out of it using cookie cutters dipped in flour. Now make a small hole for hanging the ornament using the end of a drinking straw. If you want, instead of using cookie cutters, you can mold the dough into different figurines, such as animals, fruits, flowers and more. Just ensure that the figurines are not for more than ½ inch thick. Bake the clay ornaments on an ungreased baking sheet for 30 minutes at 250ºF. Turn them over and bake for another 90 minutes until it turns hard and dry. When it’s done, remove from the oven and leave it aside to cool. When the ornaments have cooled, smoothen with sandpaper and decorate it any way you like, either with markers or acrylic paint or poster paint. Leave it to dry overnight. When the ornaments have dried completely, seal it with nail polish, clear shellac or acrylic spray. String through the metal wire or baking twine, and it’s ready. In a saucepan, add and mix salt with 2/3 cup water. Boil until the salt dissolves. Now remove from the heat and add cornstarch and half cup water to it. You will notice the mixture thickening. If it doesn’t, heat and stir until it does. On the workstation and on the rolling pin, sprinkle cornstarch. Roll out the clay with the rolling pin and cut it out with cookie cutters. Use the straw to make holes for hanging the ornaments. Leave the clay to dry overnight. When it has dried, decorate it with paint, glitter or anything you like. Just remember, these ornaments are not edible. Before proceeding, we’d like to tell you that this is an edible clay recipe and can be eaten by anyone, except those who are intolerant to gluten. And please don’t expect it to taste great. This recipe is basically for those mommies whose children put everything into their mouth. In a mixing bowl, mix together flour and salt. Now add oil and water slowly and mix until you get the desired consistency. Once it’s mixed completely, turn the clay into desired shapes. You can even use cookie cutters, if you want, to make desired shapes. If you want to give your clay a golden appearance, give it an egg yolk coating before baking in the oven. Bake the mixture at 250 degrees for at least an hour. The baking time will vary according to the thickness of the shapes. Burn until you get the desired color, but ensure that it doesn’t bake. After baking, you can decorate the clay with colorful frostings and sprinkles. Or if you are not planning to eat the ornaments, you can use acrylic paint on it. This is the first time you must be hearing about a tissue paper clay recipe that does not require PVA or any joint compound for that matter. The clay can be made with common ingredients found in the home. But before that, we’ll make homemade glue. In a microwave-safe bowl, add cornstarch, tapioca, salt and mix well. Add water, vinegar and stir well. Next, microwave the mixture for 30 seconds. If the consistency still feels the same, take it outside and microwave for another 1 minute. Again, take the bowl out and microwave for 1:30 minutes. The mixture will start thickening, which means the glue is ready. How To Make Tissue Paper Clay? Put one cup of glue in a mixing bowl and add torn pieces of tissue paper to it. Please use hands for tearing tissues, not scissors, because the clay will not be fluffy. In the mixture, add 1 tablespoon of moisturizer or lotion and knead well. If you want, you can even use an electric mixer to break down the tissues into fine fibers. Slowly, add corn flour or cornstarch and knead well. Put the mixture on the workstation and knead well for a few minutes until the dough turns stretchy. If the mixture feels too sticky, add corn flour to it until you get the desired consistency. The clay is ready. You can store this clay in a Ziploc bag. Note: Keep the homemade glue in the refrigerator. It will last you months. If the glue starts thickening, you can add a few drops of hot water to it. To make the glue smell good, add a few drops of eucalyptus oil to the Ziploc bag before transferring the glue. In a mixing bowl, mix corn syrup, margarine, salt and vanilla extract, using your hands. Place the clay on the baking or wax paper. Add in caster sugar and knead until you get a smooth consistency. To make the dough more pliable, continue adding sugar. You clay is ready. Divide the clay into small balls and add food coloring of your choice. Mix well so that the color in uniform and the dough has no streaks. You clay is ready! If you wish to make cupcakes from the candy clay, ensure that you have frosting readily available. Note: Do not make the clay on a very hot day as the butter will melt, making the clay sticky. This is the easiest and prettiest craft you can create with clay. And it will make a perfect Valentine’s Day gift too. You just need to shape your claw into hearts using cookie cutters. And if you have heart stamps, stamp it on the heart. It will give it a lovely a lovely texture the ornament. And don’t forget to give the heart a pretty pink or red color. One of the easiest clay crafts is turning the mixture into bowls. To make clay bowls, you just need to mold the clay into a bowl to form the clay shape. Remove the real bowl and bake the clay bowl to get a lovely bowl. Decorate the bowl with anything you like. This is one of our favorite fall or autumn crafts you can make with clay. You need to spread clay liberally on a maple or oak leaf, or both if you want. When the clay has dried slightly, remove the leaf to reveal the beautiful imprints. Now it’s your job to paint your beautiful clay leaf. Just try to be as creative as you can. Another easy clay craft which you can make even with preschoolers. 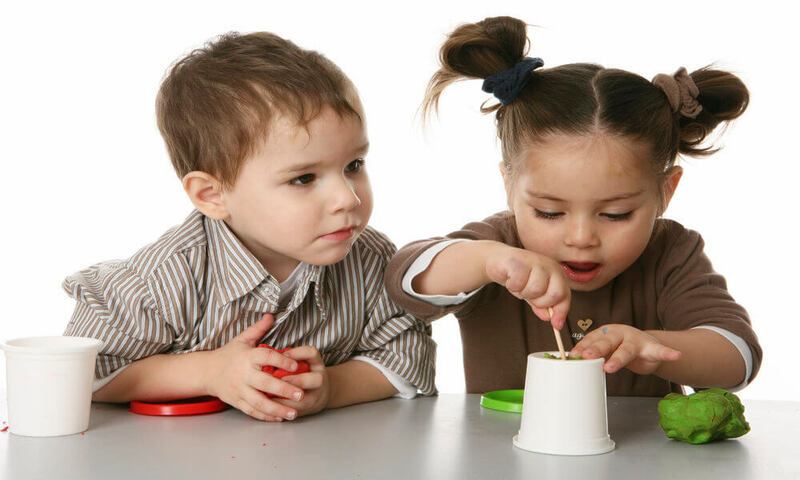 Tell the kids to make round beads with clay and press through the center using a toothpick. You’ll get a hole for threading the floss or yarn through. Now paint the clay beads in one or different shades and thread through the string. You can even make a bracelet using the same instructions. All these homemade clay recipes can be easily made at home and will surely provide truckloads of fun to children. Children can roll these clays or shape them into sculptures. They can even create footprints or other ornaments from these clays. Or they can try their hands at painting on these clays. In case you have any doubt related to these DIY clay recipes, let us know by commenting below. We’ll try our level best to assist you. And please don’t forget to check our tutorial on how to make playdough.